I met up with Jon Evans on a particularly overcast day last week at the Green Beanery in Toronto. I was fortunate to snag some time with Jon because he had made travelling something of a vocation for the past decade now. On his website, Jon’s chronological history, a rather tongue-in-cheek author bio, comically repeats ‘quits after eight months and travels …’ every year or so. Though Jon received a degree in Electrical and Computer Engineering from the University of Waterloo, he has made both travelling and writing important parts of his life. His books include three thrillers (Dark Places, Blood Prince, Invisible Armies, and Night of Knives), one graphic novel, and the much-beloved Beasts of New York. His journalism has been published in Wired, The Guardian, Reader’s Digest, and The Globe & Mail. While I had planned to talk about Jon’s favourite parts of BoNY and the process of getting the novel published, to my delight we also ended up talking about mythical, buried sail boats, mountain lions in Los Angeles and squirrels in the walls of his childhood home. Come on and take a look at my conversation with Jon Evans … ! Porcupine’s Quill: So, computer software and writing. Could you explain that one to us? 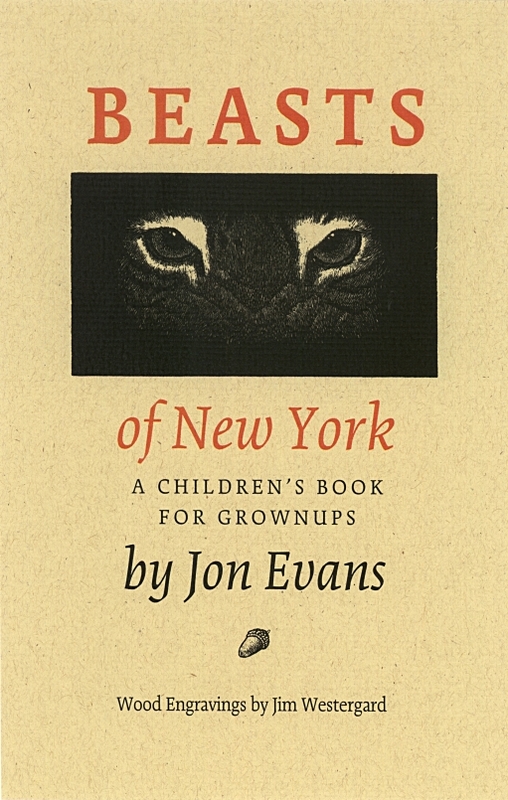 Jon Evans: To me it has always made perfect sense because I started writing when I was about eight and then I found out I was good in math so the two were always connected. I kind of liked the tech side of things and I figured I would never actually make a living as a writer so I went ahead and got an engineering degree. And then I bounced around a little bit working and writing, and working and writing, and working and writing, and then I ended up writing full time for about five years. PQ: But now you’re back into software for a bit. JE: There is this boom going on in the tech world which I expect to go ‘pop’ in the next couple of years, so once it crashes I’ll go back to writing books. I get easily bored. When I was writing full time for five years that got a little samey-samey too after awhile. I appear to thrive shuttling back and forth between two things. PQ: BoNY is a unique story, and it’s different than the other books you have written. When did you get the idea for BoNY? Why did you have to write it? JE: It’s a weird story, but I got the idea in Montreal where I was living at the time. I was walking down the street where I lived and I saw this squirrel running along the electrical cable above the street and I thought, some of these animals here are better adapted to the city than we are. … And I keep walking along and thought nothing of it. But the idea would not go away. I’d go out for runs in the park and I found myself looking at the squirrels and the other animals. … I guess it’s this quasi-romantic notion of the haunting idea that will not leave you alone but then actually gets quite irritating after awhile. So after a few months I realized I was going to have to write the book. I’m not entirely sure why I decided it was going to be New York though, rather than where I was living or somewhere else. But I had spent a year or two in New York and I always loved the city and I figured it would be a good excuse to go back. So this is, obviously among other things, my love letter to New York City. So I took a month off and cooped myself up in this place by Central Park and hunkered down and wrote the book. It was a bizarre experience because usually it’s a bit like pulling teeth writing, but with this book and my first book it all flew very easily. I was cranking out about three thousand words a day, which is a lot, I mean it’s hard work getting out two thousand. And I was travelling all over the place and researching the city at the same time, but it all flowed very naturally for once. One of the very rare instances where that actually works. PQ: What more can you say about the writing process? JE: I think I wrote the first half in fifteen days and then I wrote the second quarter a few months later when I was in L.A., and then I came back to New York for ten days to finish it. So it was about thirty-five, forty days altogether to write. By this time I was kind of a pro. I had published four novels and a few of them were ones I worked on ‘scientifically’ rather than being inspired the whole way through, so I had gotten accustomed to writing from a scientific point of view. As in, okay, the story needs to get from point A to point B. That did not happen with this book at all. This was totally relying on my subconscious, sitting down at the keyboard and hoping something good came out. PQ: Did you do much editing afterward then? Did you find it was all over the place and had to be compressed into a story? JE: Surprisingly, no. The actual ending of the book where all the apparently random threads of the first half come together was not planned, it sort of hit me a few months after I wrote the first half how it all worked together and how everything would be reasonably tight. So after I finished the first draft there was some editing but it was pretty loose, kind of a rolling re-write and clean up more than actual surgery. And then when I finally sold it to PQ, a very, very good professional editor came in and sat down and correctly advised that I chop a bunch of it out. This is about ten thousand words shorter than the original, or the first online version. But even then that was just cutting stuff down more than making huge changes. PQ: I’m especially curious that BoNY is so different than the other books you’ve written. I think there are similarities in that you’ve often written about travel, adventure, and suspense and BoNY is like that just with squirrels, but it does feel very different. JE: The style is different. I think for my thrillers I made a conscious choice that I wanted to have a transparent writing style that wouldn’t get in the way of the story. And with this one I made the semi-conscious choice that I wanted a more expressive and impressionistic style. You know, it would be okay to use the occasional two-dollar-word even if there was a shorter word to use. PQ: What was your favourite part to write and why? JE: I think it may have been the part that goes on underneath the streets of New York. Probably because I did a whole bunch of research on that. There are a surprising number of books about what is buried under New York City. And there is a surprising amount of stuff buried under New York City. It sort of felt like this mythical place that was completely surreal. There’s this enormous old tunnel, buried sailing ships, and entire highways and so forth, that are in fact actually there beneath the streets of Manhattan. JE: Yup. Yeah, that actually didn’t make it into the book, alas. I was trying to find a way to force it in but it just wasn’t going to happen and I had to accept that. … Also the suspension of disbelief is kind of a problem with the ship. Or the highway. There actually is about a hundred metres of a fully painted six lane highway buried beneath the Lower East Side of Manhattan to this very day. It’s been there for thirty years—it’s under the ground. Which is insane of course. But you can’t just put that in a book because no one will believe that. It’s ridiculous! PQ: I also wanted to ask you about the publishing process for BoNY. I know that a lot of publishers initially rejected the manuscript and so you published it yourself online, and then it got picked up by the Quill. JE: Yes, although there was a long gap between me publishing it online and it getting picked up. I was, and am especially more so now, quite proud of this book and it got a lot of interesting maybes and not-quite-sures, so I decided to publish it online and pretty much no one read it. So I went away and forgot about it, and I came back in a year and found out it had actually picked up a sizable audience online while I was away. Someone else had put it on some big book sharing website and some ten thousand people had been reading it. And I was unaware of this the whole time. So I realized I should look back and this weird little thing I wrote. I got this published actually the same way I got my agent back in the day by cold emailing people I had never met before. So I just emailed Tim Inkster at the Porcupine’s Quill. PQ: And how did you hear about the Quill? JE: I guess it’s a small Canadian literary world, one of my few interactions with the Canadian ‘literary scene’ was in one creative writing course in university and Russell Smith, who wrote How Insensitive, came in to talk to us. How Insensitive, if memory serves, was published by the Porcupine’s Quill. And I thought, well that house sounds interesting from that talk I heard fifteen years ago, I’ll see if they’re still around. PQ: Your editor Michael Worek took great interest in this novel; how was the experience of getting this book published compared to the experience with your other books? JE: It was quite personal. My publishers in the UK and the US, and actually Harper Collins here, they’re behemoths from a literary perspective they only have so much time to spare for any given project. Whereas PQ was really interested in detail work, down to the little endcaps of the book. And the copyeditor, Chandra, really went above and beyond the call of duty. I was a little terrified at first. I picked up a copy of the manuscript and it was just this sea of red marks. But it was in fact all really thoughtful and carefully done. It’s a really beautiful book, I was actually really, really happy with it. PQ: What’s next? Are you writing anything new right now? Although I am planning to write at some point a sort of, kind of sequel to this: ‘Beasts of Los Angeles’. I’m not quite sure when that is because I need to carve out some time to go spend in Los Angeles doing some research and so on. And for obvious reasons there won’t be so many direct connections between the two books. PQ: Patch has gone far but I don’t think he can go that far! Maybe one of the birds could go to Los Angeles. …What kind of animals might be in that book? JE: I think it would in fact have to be bird protagonist if I’m going to connect it to the first book at all. Though there is a lot of crazy nature in L.A. There are mountain lions within the city limits of Los Angeles. JE: Wild mountain lions. In the Santa Monica Mountains above the city. JE: Yeah, they might be there somewhere. … As a side effect of having written this book, I get a lot of squirrel stuff emailed to me or specifically sent to me from friends. So there’s this assumption that I’m really into squirrels, which is not actually true, but it’s entertaining and I appreciate it all the same. PQ: Is there anything in particular you want your readers to know about this book? JE: It was I think the most fun to write of any of my books, and I like to think of it as also the most fun to read. Well there you have it, friends! Jon Evans on books, buried ships, and ‘Beasts of Los Angeles’! Don’t miss Jon Evans at the Gladstone Hotel next Sunday, November 27. Jon will be reading excerpted passages from his novel, with the assistance of an interactive map of New York City. You can follow Patch on his journey, from his Drey all the way to the subterranean passage of America’s most famous city. Until next time pals, Porcupette out! 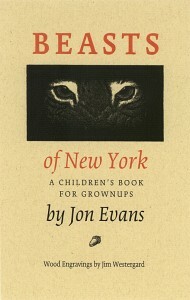 This entry was posted in Letters from the Porcupette (the Intern's Blog) and tagged Beasts of New York, Jon Evans, mountain lions, New York City, sail boats, squirrels. Bookmark the permalink.